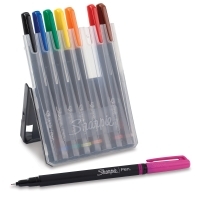 Sharpie Art Pens make bold, vivid marks, and they won't bleed through paper! 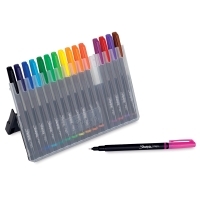 Unique extruded plastic tips assure durability and line-width consistency, and fine points deliver crisp, precise lines. 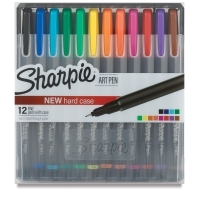 The caps match the ink color. 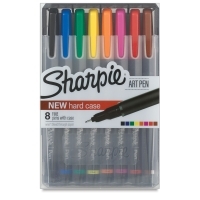 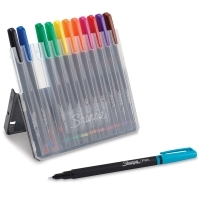 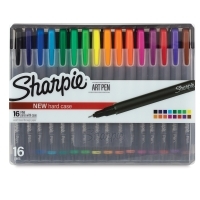 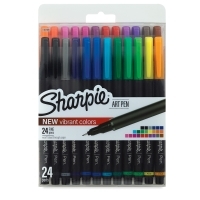 Sharpie Art Pen Value Pack — This set of eight Sharpie Art Pens in a variety of colors is ideal for keeping a travel journal, doodling, or writing. 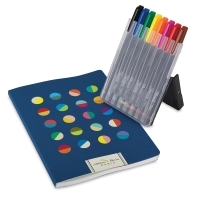 The hard plastic case is a perfect traveling companion for the Alibabette Paris "Planetes" Journal. With a cover design inspired by the colors of the stars and planets in our galaxy, this journal holds 100 lined pages of acid-free ivory paper (100 gsm), stitched into a binding that lies flat when open.